Oxford student Gratia Sullivan unearths a bunch of radishes destined for the campus kitchens and community consumers. Photo by Kay Hinton. As an undergraduate biology major at Clemson University, Daniel Parson recognized the disconnect between environmental sustainability and traditional agriculture. He went on to get a masters degree in plant and environmental science from Clemson and spent more than a dozen years working in organic farming in Georgia and South Carolina. "We look at nature as wilderness, but we also need things from nature and we need to learn how to get them without destroying it," says Parson. He joined Emory's Oxford campus in 2014 to run the Oxford Organic Farm, an 11-acre piece of land that provides produce for the university's dining halls and farmers markets and unique learning opportunities for students. 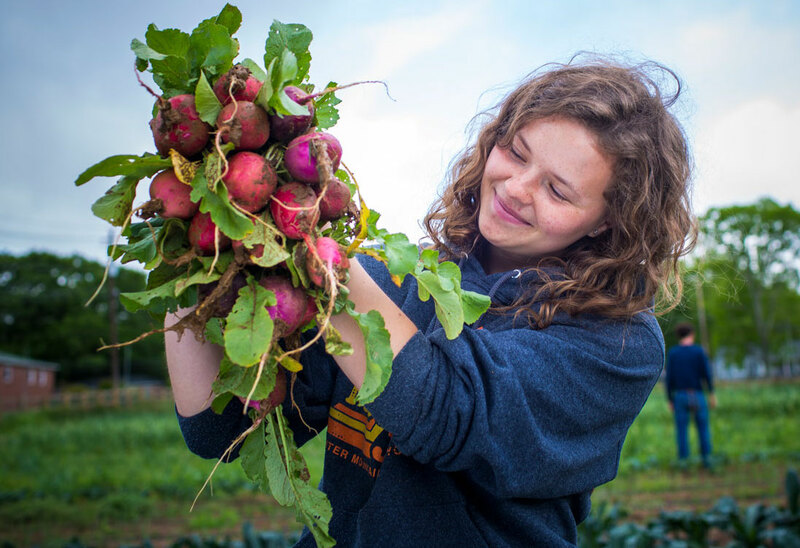 "We try to match the seasons with when students are on campus so our work-student students who are here every day have the best experience possible and so we can work with faculty to connect course curriculum to the farm," says Parson, whose official title is farmer-educator. "For economics classes I might talk about how we set prices and interact with markets, but for other classes I may just be talking about the experiences I've had and how that connects with what they are discussing in class."